Home / What’s YouTube saying about QuiBids? Alright, time to fess up. Which of you are YouTube junkies? QuiBids is on YouTube and we’re not just talking specifically about our own channel. Customers use the video streaming site to share their QuiBids strategies, tips, tricks, mostly with helpful guides and unboxing videos! As a resource, YouTube’s a particularly rich database for the astute, carefully studied QuiBids customer. So I dug up a handful of fairly recent QuiBids-centric YouTube videos to share with you guys, each of which has some pretty sound strategies. Before we start though, I offer this caveat, in the interest of saving you time and preserving your sanity. When you’re looking for information about QuiBids on YouTube, avoid videos with really ridiculous headlines like How To Get FREE Unlimited Voucher Bids on QuiBids easily, Quibids 1000 FREE BIDS 2012 Voucher Link LEAKED with PROOF, or How to get a Quibids 100 + Bids Voucher for FREE!!. Videos like these are typically unaffiliated with us (the uncapitalized “b” in “QuiBids” is usually a dead giveaway) and can sometimes just be marketing ploys looking to make a quick buck. If it’s free Voucher Bids you’re looking for, we do offer plenty of other options though! Let’s get started with the videos, particularly with four by YouTube user hansoobids, who’s put together some solid tutorials and advice for your QuiBids strategy. As a general overview and advice to new users, this video and its counterpart below are chockfull of useful information, most of which can be found over at QuiBids 101. I should point out that our name isn’t pronounced the way he does it, though. It’s QuiBids as in “quick bids”! Here hansoobids stays with fairly rudimentary strategy like how Buy Now works and QuiBids Games, and the differences between Voucher Bids and Real Bids. Our third video starts getting into the territory of more advanced strategy, focused around the Bid-O-Matic. Hansoobids recommends a “Bully” strategy as being effective, but to avoid simply leaving your Bid-O-Matic on, particularly in situations where other users have their Bid-O-Matics set. QuiBids Video #4: Know when an auction is coming to an end! It’s impossible to predict exactly when an auction is going to end, simply because anybody can prolong an auction simply by hitting the Bid button. But making an estimated guess as to when it will most likely end is an invaluable skill on QuiBids. Scanning auction statistics is a good way to get a rough idea of the range of the final auction price. Scanning the Bidding History for information is another helpful indicator of how long an auction may last. Hansoobids points out that going against QuiBidders who’ve recently won big Voucher Bid auctions is probably unwise. QuiBids Video #5: QuiBids Pro Tips and Tricks! -stay away from front-page items. -stay away from big-ticket items. -start with smaller gift cards. They tend to go cheap. Justin also offers the following very good rule of thumb as his number-one priority: Do not enter if the number of recent bidders is over ten. Let’s all congratulate Gray on his big win, a DBest Solo Speaker! This one’s more of an unbagging, really. It doesn’t take a lot of packaging to ship memory cards! 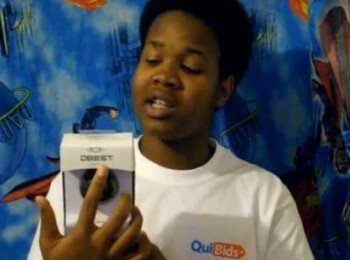 Lastly, as a bonus, here are some of QuiBids’ greatest YouTube hits! Enjoy, and happy bidding! QuiBidder of the Week – David Di Franco, Jr.